The seventh day of each week is the Sabbath; the fourth of the Ten Commandments, the day which Yahweh ordained to meet with His People. The Seventh Day Sabbath is Eternal. It will always be the weekly day for families to assemble together with Yahweh throughout all Eternity. Verse 23 shows clearly, the Seventh Day Sabbath will remain forever. The Roman Catholic Church took the Seventh Day Sabbath away from the world. They have this world’s religions thinking there is no need to keep the Seventh Day Appointment with Yahweh. They even teach doing away with Yahweh’s Laws altogether. Christians claim they follow the Savior. They claim the Savior abolished; that is, did away with, the Laws of Righteousness. But they lie. Read the Savior’s Words. They are lying to deceive their victims. In fact, there are 4,199 religions in the world today, and all of them practice sin. Where does your Bible put them? Read it for yourself. They have the whole world deceived. Why would you take the words of a liar, a lying religion, or as Yahshua Messiah called them, false prophets over the Inspired Words in your Bible? The Roman Catholic Church came from the Coptic Catholic Church, a religion that deifies its leaders, such as the pharaohs and priests of Egypt, rabbis in Israyl, and popes in Rome. They are one-and-the-same religion. It was brought out of Egypt by the twelve tribes of Israyl, who came out of Egypt with Mosheh; but they never repented of God worship. Yahshua Messiah said, the Sabbath was made for man (Yahc. Mark 2:27). The Sabbath was made to be the weekly Eternal Appointment with Yahweh, the day on which the Great Yahweh Family comes together in Holy Convocation. So the Sabbath came next. Think of that! Yahweh, the Greatest Being in the universe, the Creator of the heavens, earth and mankind, meets with us. Yahweh made the earth for mankind. Yahweh made the Sabbaths for mankind. Yahweh made the earth and the Sabbaths for the purpose of training mankind to become Righteous sons and daughters of Yahweh. The beastly system of Coptic and Roman Catholics changed the Sabbath from the Seventh Day to the first day of the week. In so doing, they tell all their followers to avoid everything Yahweh says is Righteous and be evil as the Gods. Notice verse 5, evil as the Gods. They named the first day of the week Sunday in honor of their sun God – Baal-Lord. The word Lord is a title of their rabboni fathers. Lord is not a sacred title, but the Catholics used it to replace the Creator’s Name in all versions of The Book of Yahweh. Yes, Bibles, such as the King James Version, are versions of The Book of Yahweh. The Name Yahweh was used exclusively by Yahweh’s Prophets, Yahshua Messiah and His Disciples. 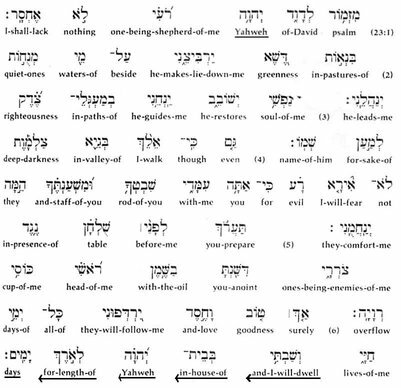 Read Psalm 23, as it was originally written, from The New International Version Interlinear Hebrew-English Old Testament by John Kohlenberger III. You read Hebrew from right to left ß. Notice, The House of Yahweh is forever. Our Father Yahweh is forever. Yahweh’s Instructions to mankind, which show the way to Righteousness and Eternal Life in a Kingdom without fighting and war, are forever. The religions that practice evil are not forever. Those who rebel against Yahweh’s Laws of Righteousness, as the Roman Catholic Church does, only have a few days left. This is shown by Yahweh’s Prophets and Yahshua Messiah. There are 4,199 religions in the world in this generation that refuse to repent and convert. Many Prophecies show where they’re fighting in wars at this time, and in this generation. This generation started in 1934. They will burn themselves up with nuclear burning, your Bible says. The means of nuclear burning was invented in this generation that started in 1934. Don’t forget, we answer all Scriptural questions at The House of Yahweh. Verse 2: Those who reverence the Name of Yahweh? Yahweh’s Prophets show Protection for His People from these nuclear wars in this generation. Remember, you belong to whom you obey. If you don’t practice keeping Yahweh’s Sabbaths, you belong to Satan. All of Satan’s religions are trained for war. They are forbidding the Seventh Day Sabbath of rest. Those who worship/serve the beast have no rest. The smoke from their continual wars never stop going up. We, Sabbath-keepers of Yahweh, rest with Yahweh each Seventh Day Sabbath. But those who serve Satan (Rom. 6:16; Yahc. 8:44; I Yahc. 3:4, 7-8, 10) have no rest day or night. And the smoke of the death and destruction, which is the consequence of their sin, ascends up on that day. And they have no Sabbath (rest) night and day, who worship the beast and his likeness, and whoever receives the mark of his name. I am one of Yahweh’s Two Witnesses. That’s why, we, The House of Yahweh, are sending out this Last Days’ Warning. I pray to help each one of you who desires Yahweh’s Righteousness. I hope to see you quickly.